Atlanta, GA: The second Panchahnika Brahmotsavam (annual celebrations) of Lord Ramalingeshwara, presiding deity of the Siva temple located in the Hindu Temple of Atlanta, Riverdale premises was held from August 13 – 17. 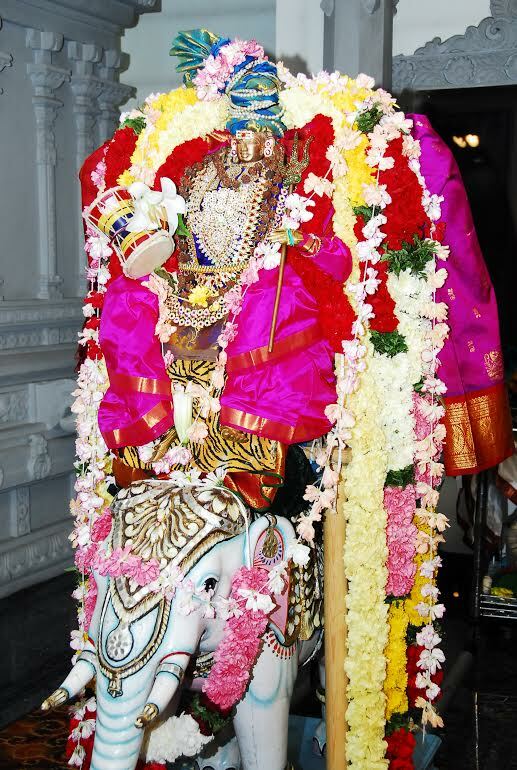 Brahmotsavam means a grand celebration, and is considered a very auspicious occasion for every devotee. Celebrations began with Ankurarpana on August 13. Temple priests Adarasupally Srinivasa Sarma, Kristapati Pavana Kumar, Sunil Kumar Durgaraju and Dusi Sivanaga Kumar performed elaborate rituals to propitiate Lord Siva. 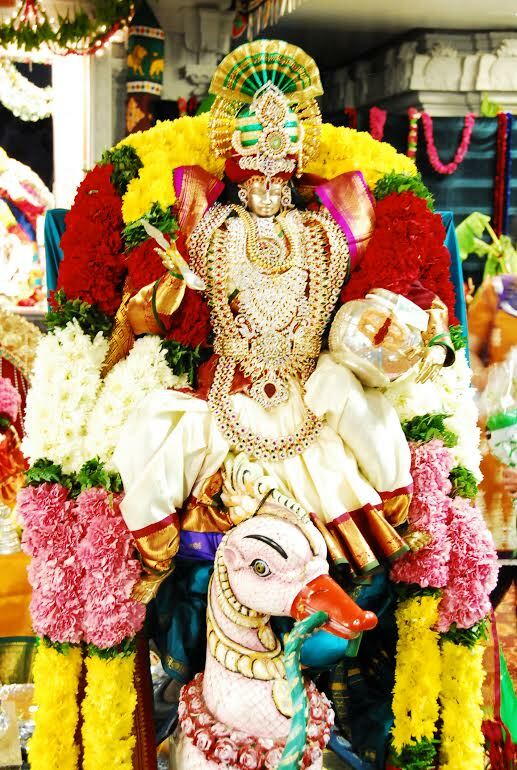 Siva Alaya Panchahnika Brahmotsavam began with Ganesh Pooja, Punyahavachanam Ritvikvaranam, Ankurarpana, Dhwaja Aarohana, Surya Prabha Vahanam. Vasthu Homam, Hamsa Vahanam, Teertha Prasada viniyogam. The five day celebrations included various rituals like Kalasa Sthapana, Pradhana Homam, Gaja Vahana Prakaram, Lalitha Sahasra Nama Homam in the morning and evening, Nandi Vahana Prakaram, Asthottara Satha Kalasa Sthapana, Sri Rudra Homam morning and evening, Siva Parvathi kalyanam, a grand Ratha Yatra, Ashwa Vahana Prakaram. On the concluding day on August 17 Maha Poornahuti was performed in the presence of a large gathering of devotees. The final day rituals were Asthottara Satha kalasa vasanta abhishekam to Ramalingeshwara, Trisoola Snanam, Dhwaja Awarohana, Ravana Brahma Vahana Prakaram. The five day celebrations concluded with Sri Rudra krama archana, Visesha Sayanotsavam and Raja Aseervaadam to the community and trustees. Parvata Vardhani sameta Sri Ramalingeshwara Vigrahas were installed on May 29, 2004 in the newly built Siva temple. Subsequently on completion of Indianization of the exterior of the temple in accordance with Agama Sastras, Kumbhabhishekam was held on March 21, 2008. The installation of Dwaja Stambha in front of Siva temple in November 2012 completed all requirements for performing Siva temple Panchahnika Brahmotsavam. 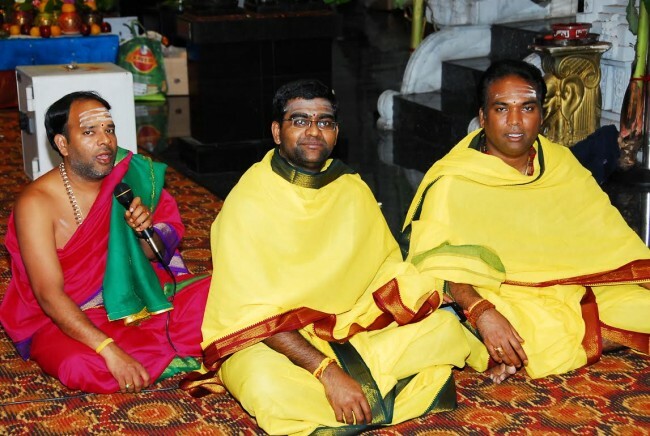 The first ever Brahmotsavam was held in 2013. 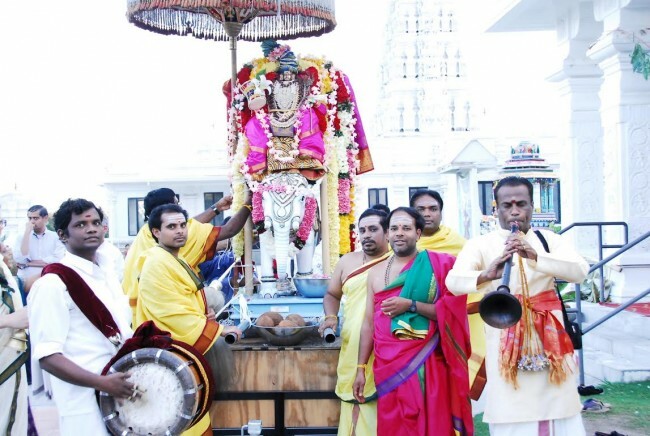 Participating in the Brahmotsavam is a rare opportunity to all devotees. The experience of attending the Brahmotsavam will be cherished for a long time as a pleasant memory. The Siva temple complex includes a cluster of shrines including those of Ganesha, Sri Valli Deva Sena sameta Kartikeya, Parvata Vardhani, Nataraja, Kala Bhairava, Jnana Saraswati, Kanyaka Parameswari and Subrahamanya. The principal deity is an impressive Sri Rama Lingeswara. Other festivals include Maha Sivaratri, Pradosham, Subrahamanya Shasti, Nagula Chaviti, Vasanta Panchami, Sarannavaratri etc., which are performed in a grand manner. Trustees, executive committee members and devoted volunteers made excellent arrangements for the Brahmotsavam celebrations.